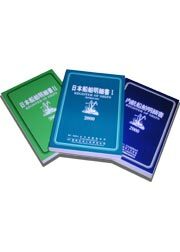 Publications of the Japan Shipping Exchange, Inc. The "KAIUN" provodes maritime and logistics trends in Japan and Worldwide for maritime and logistics-related persons. The "KAIJIHO KENKYU KAISHI" is only magazine in Japan, which provodes information of maritime law, maritime and logistics contract forms. Published annually, containing extract reports of the arbitration awards and contents, introduction of new forms change, records of the activities of the Japan Shipping Exchange, etc. The "MARINERS' DIGEST"'s mission is "Cultural Exchange". The Japanese ocean-going vessels, which are of non-Japanese flag, have been operated by huge numbers of seafares, especially Filipino seafares. We believe that The "MARINERS' DIGEST" will graetly cotribute to undrestaining each culture. The "Register of Ships" contains the names and particulars of all merchant ships registered in Japan. contains mainly the names and particulars of ocean-going ships over 100G/T registered in Japan. contains mainly the names and particulars of ships between 20 to 99.99 G/T registered in Japan. The "Register of Ships of Coastal Ships in Japan"
contains the names and particulars of Japanese coastal marchant ships over 100 G/T registered in Japan. contains PC available data of above three "Register of Ships" with viewer programme(Runs under Japanese version Windows ®). The "KAIJI KANREN GYOSHA YORAN" contains the names and particulars of a lot of maritime and logistics related comanies and organizations. "Distance Tables for World Shipping" will enable readrs to calculate quite ealily the distanses port to port which are not available from the Charts at first hand.